New Release Auto World Xtraction Knight Rider KARR Firebird FT! $7.05 Ship! Lot Of Assorted Vintage Slot Cars And Pieces, 7 Vehicles, 3 chassis, For Parts. The car is used, but is in good condition and runs just fine. The chassis could stand a good cleaning and a tune-up, but everything's there and working.with a few minutes' work, you'll have yourself a very nice runner. It's a Tyco 440X-2 body and chassis. The body is also in nice shape.there are a few signs of normal wear and tear, but nothing's broken or missing. TWO CARS ARE LIONEL. ALL RUN NEED A GOOD CLEANING AND OILING FROM SITTING. NICE LOT LITTLE CARS. CHECK OUT THE PICTURES. Tyco Magnum 440-X2 #24 DuPont. Condition is New. Sold as is. Please see pictures for accurate description. Shipped with USPS First Class Package or Priority Mail. THESE ARE MAGNATRACTION BUT CAN BE USED ON NON-MAGNATRACTION AS WELL! AURORA AFX. THESE ARE ALL ORIGINAL AURORA AFX PARTS. MOST OF THESE WERE TAKEN DIRECTLY FROM A PARTIAL CASE OF N.O.S. AFX CHASSIS! 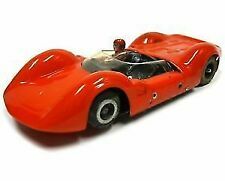 RARE TOMY/AFX - JAPAN BUBBLE - INDY #30 LAMBORGHINI LARAUSSE "GEO" "ESPO" - SUPER G - HO SLOT CAR. Japan EX011 SG ESPO F1 car. It is dark blue with multi colored stripes #30. The car body is in great condition with no wear to the tampo print. Sorry, I don't know who made this, or what kind of chassis it is (I'm guessing it's a modified Tyco chassis, but that's just a guess). The bike is used, but is in good condition and it does run. Fits AFX chassis that will correspond. (see pictures). (BODY ONLY). Fast and Furious. Works on Aurora, Auto World, Model Motoring, Johnny Lightning. This auction is for a vintage TYCO US 1 TRUCKING FIRE TRUCK SLOT CAR . Condition is as seen in photos. Tested and it runs (moves slow) bell rings but the light does not work. Tires have wear and could be replaced. Otherwise nice and clean vintage TYCO fire truck. Winning bidder to pay shipping cost by using calculator on this page. Vintage Tyco ho slot cars junkyard lot sweet! Slot car racing is an exciting hobby that gives you the opportunity to live out your raceway dreams with realistic HO scale motor vehicles. 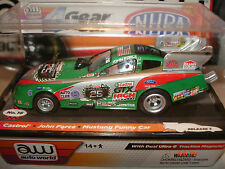 Wide arrays of collectible slot car items are available in HO scale. This is the same scale that hobby companies make HO trains in, so you'll also be able to find a large number of scale scenic items for your racing layout. What size are HO slot cars? While all HO slot cars are supposed to be the same scale, there are actually several different sizes you'll come across. Original 1960s-era HO equipment is close to the same HO scale that model railroad companies make equipment for. HO is defined as a 1:87 ratio size, which is half of the older O scale. Later equipment is often closer to a 1:64 ratio size. You'll see some commercial and shop-tracks using a slightly different definition of HO scale as well. What types of slot car controllers are on the market? Can you combine slot car track pieces from different manufacturers? While HO slot car wheels might be compatible with different track types of raceway equipment, you'll need to check the rail joiners before you combine parts from different manufacturers. Each company has its own way of making HO scale slot car track. Aurora and Tyco have used different types of racing adapters. You'll want to check to make sure that the chassis pieces all fit snugly together before you stage any racing events over curves. How do you clean an HO scale slot car track? 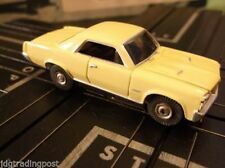 Cleaning slot car track takes a delicate touch, but there are a number of items available on the market that can make it easier. Clean the rails every so often by either using an ink pen eraser or a Brite Boy model railroad abrasion tool. Make sure to use a small amount of pressure and never create ruts or uneven points while you're clean. Be very gentle in order to prevent damage to the track. Track cleaning compound or window cleaner is needed to keep the actual slot car track joints free of dirt. Keep the counter that the track is installed on clean as well.